Have you ever been to an art gallery (or, more often, a touristy gift shop), taken a look at the Aboriginal works on display there and wondered to yourself at the – how can we put this – at the authenticity of the pieces? One great way of knowing for sure that what you’re looking at is the real deal is to take an aerial Aboriginal Art Tour. Fly to incredibly remote outposts to watch works of extraordinary beauty and complexity being produced right before your very eyes. 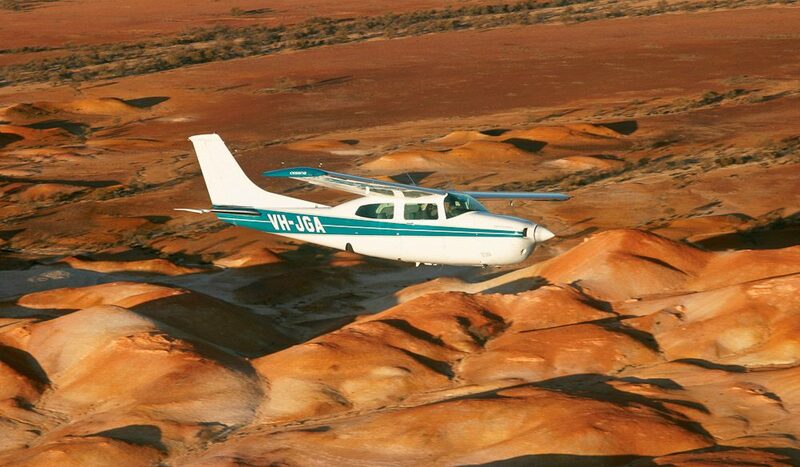 Trevor Wright from Wrightsair, based in William Creek in outback SA, runs tours to three major art centres, all of which – Ernabella, Fregon (Kaltjiti) and Indulkana – are more than 1300km from Adelaide by road, deep in Anangu Pitjantjatjara lands. Which is why it makes far more sense to fly there. Once there you’ll have a chance to view artists working in their own environment and to learn about a culture that stretches back more than 3000 generations. All permits are handled by Wrightsair, who are very passionate about the art and culture of these remote communities, and who point out that buying art direct from the community is incredibly important, as all monies go straight back into that community. DID YOU KNOW? // The people of the Anangu Pitjantjatjara lands have a strong tradition of contemporary art practices, and in fact Ernabella Arts is thought to be the longest continually running Aboriginal art centre in Australia.